sirloin steak, cut as thick as you can find, or some other cut like New York strip or Porterhouse. You don’t need fancy dry-aged steak, but do try to get something at least 1-inch thick; 1.5- or 2-inches thick cooks even better. 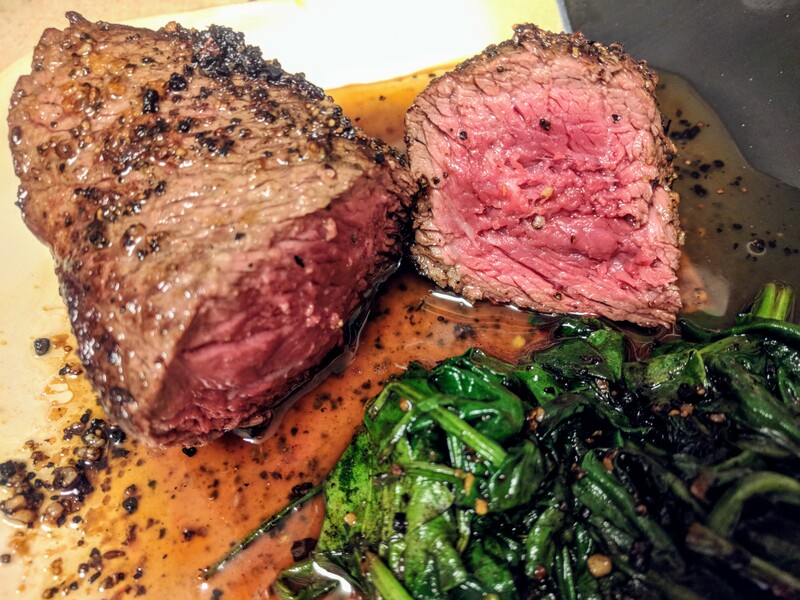 Steakhouse steak is easy to replicate. I’ll share the stove-top method on which I’ve settled; check out Kenji Alt-Lopez’s The Serious Eats Definitive Guide to Steak for other options, including using an outdoor grill. Get a cast-iron pan very hot. Beware of heating non-stick pans over 700 F (for health concerns). Season your steak with large cube kosher salt, pepper, or a dusting of chili powder, or my favorite, berbere. Introduce some fat into the pan. Bacon fat or a cooking oil with a high smoking point are good choices. Lay the seasoned steak into the pan, cooking for perhaps two minutes on a side, with a bit of time on each edge. Remove the steak to a serving plate to rest. Turn down the heat to medium. In the same pan, with a spatula at the ready, add the minced garlic. Quickly, before the garlic can burn, add the spinach leaves. Wilt the mixture by constantly moving and flipping for half a minute. Move to serving plate. Turn off the heat. Enjoy. Portland enters a new era… with me!